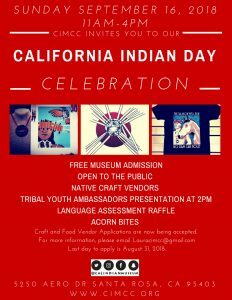 Join us Sunday September 16th for our California Indian Day Celebration. We will be here 11am to 4pm. Our Tribal Youth Ambassadors will have a presentation at 2pm. Don’t miss out! Craft and Food Vendor applications now being accepted! Email Laura Mendoza for more information.